A few years back I had an opportunity to look through some personal papers left by a man who had lived on the Mojave Desert most of his life. He was an able writer and a number of his subjects interested me. 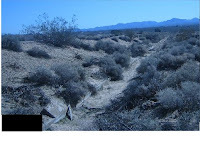 One in particular described how a few early settlers near Barstow believed that water could be coaxed from the dry Mojave River bed by means of a submerged dam and that water could then be conveyed down stream for the irrigation of crop land. Keep in mind that, except in very wet years, the Mojave River flows beneath the sand and for most of its length is not visible on the surface. There were few takers. Desert agriculture was considered a losing proposition due to hot summers, high dry winds during the planting season, and relatively poor soil. Also, it didn’t take long to realize that the amount of water brought to the surface was but a fraction of what was anticipated by the developers. And on top of that, legal problems erupted over conflicting water claims and government homestead requirements. As a result, the company quietly discontinued operation and filed for bankruptcy. Those associated in any way with the company suffered raw western humor at saloons around Barstow in days leading up to the filing. With the dam completed only halfway across the river, flow down stream was less than three percent of what was predicted and reached agricultural land far short of what was planned. In 1901, a new company was formed to buy out those who still had interest in the project. With little capital and great determination, the four new owners set out to clean and reline the canal and improve flow from the dam. They succeeded in bringing enough water to farm about 200 acres east of Daggett and from then on the operation was referred to as the ”Daggett Ditch”. Failure of the initial enterprise is clearly evident from federal land records. Between 1892 and 1894 over 1800 acres had been staked­ for homesteads in the proposed development. By 1910, claims on all but about 500 acres had been cancelled. According to a geologist report, “In 1919 [the] project consisted of 3.3 miles of concrete conduit 1,720 feet tunnel lined with redwood , extended from the head of the concrete conduit to the head of the tunnel; and 587 feet of head tunnel lined with redwood. … The head tunnel is 3 feet by 5 feet three inches in diameter. It is lined on all sides but the bottom lining is loose. The report goes on to state that in the Fall of that year (1919) six wells had been drilled into the head tunnel to increase flow. Over time, these and other improvements insured a supply of water to a few farms. 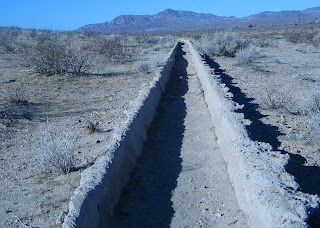 The “Daggett Ditch” continued in operation until 1973. The dam was located in the Mojave River northeast of the Marine Corps Logistics Base (photograph number1). There is nothing left of either the dam or attending structures; all have been swept away by major storm. The concrete walled canel is still visible along most of its three mile length. It extends from N34 52.259W116 55.637 on the west to 34 52.117W116 51.899 east of Daggett. It is located north of and parallel to the Santa Fe Railroad tracks.